We’re thrilled to be bringing our acclaimed adventure title Machinarium to PS Vita. When the PS3 version was released, we called it the best version of the game. In it, we added lots of new features — like the ability to zoom in to get a closer look at the scene, magnetic hotspots, Trophies and more. The Vita version makes no compromises. In fact, it’s even better! It includes all the enhancements from the PS3 version, but we’ve added some new features to complement PS Vita’s capabilities. You can now control the game not only with the system’s analog sticks and buttons, but also directly with your fingers on the touch screen and rear touch panel. We’ve improved the zoom feature too, so it’s more convenient to play the game in a portable capacity. The graphics, music and sounds are presented at full quality, and everything runs smoothly and looks as beautiful as ever on Vita’s gorgeous 5″ OLED display. For the best audio experience, put on some nice headphones so you can fully enjoy the award-winning soundtrack by Floex. We’ve also integrated PSN leaderboards: see how quickly you can finish the game, and how your time stacks up against the rest of the world (compete for the best scores in Machinarium’s minigames, as well). All in all, we are very happy with the PS Vita version of Machinarium. It will be available on Tuesday, March 26th for $6.99; check out the Amanita blog, and follow us on Facebook and Twitter for all the latest. Let us know what you think! Silly Amanita, don’t you know the Vita has nogaems? Great news, I look forward to playing it in the go. If you are a Vita owner who has never played this, count yourself very lucky to have this opportunity. 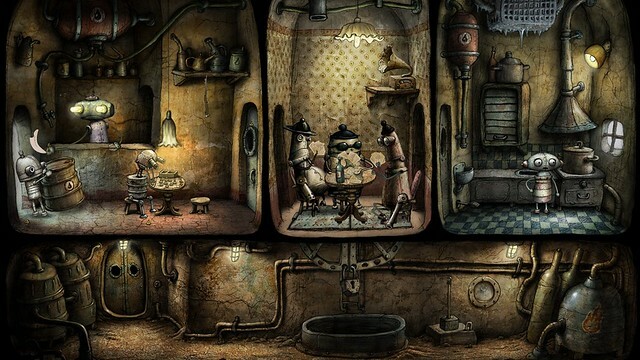 Machinarium is a wonderful example of smart Adventure design. Combined with the captivating art style, it’s a modern classic. Bought this over the 13 for 13 sale for 2.75$ & had a blast!. One of my favorites & to see on the Vita is awesome, totally recommend it. Any discount for PS+ users or those who own the PS3 version already? Also, will PS3 and Vita share trophies or will the Vita have its own set? Please, Sony, convince the people of freebirdgames and bring “TO THE MOON” to the console and you complete the circle. You can do it, Sony! Glad to see this is coming to Vita. When I played it on PS3 I always thought the experience was much more suited for the Vita. Any chance that there will be a discount for owners of the PS3 version? Rocketbirds Hardboiled Chicken gave a 20% discount, which was really nice. Day one. Seriously though, Sony needs to get their act together and release 64/128GB cards already. My 32GB card is dangerously close to full and not buying another until the price drops or a bigger card is released. I can’t really imagine playing this game with buttons… Sounds interesting. actually I enjoyed the testing of the game with analog sticks and buttons more than when I controlled it on the touch screen. there are shrotcut buttons for getting into the inventory for an item and back to the stage and you can expand and shrink the robot easily with the right analog stics. it’s suprisingly convenient. Is this cross buy with the PSN version? If so I’m interested. Yes! And drop the price on current ones. 128GB MC for $99.99 please. unfortunately it’s not a cross buy. I also would like to see a Trailer, it looks very nice. Thanks for the heads up Jakub. I have been waiting for this to come to the vita. I looked at this game and said it would be perfect on the vita. This price seems like a steal for this game too. It’s going to be steampunk Tuesday on 3/26 with this game and Bioshock Infinite. Can’t wait, so excited!!!! 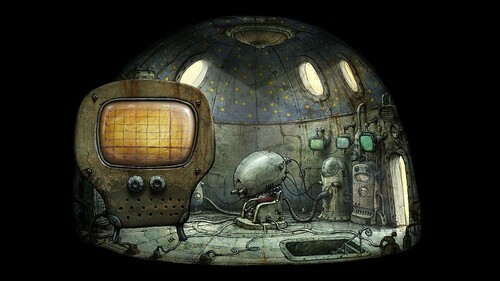 I’ve already got Machinarium and finalized on PC and PS3, but buy it for the vita also because it is an excellent game. OMG!! WHAAAT?? I want buy DOA 5+ next week , and save some money for Soul Sacrifice. But with this,…Sony dont love mi wallet. Loved playing through this game on the PC. Not sure if Machinarium was happy on my laptop, so I’m likely picking this up again on PS3. If I get a Vita sometime soon, then maybe that version too! hooray! sooner than I expected. This is the platform I’ve been waiting for. I’ll definitely pick it up. I bougth it on PSN the day it was released, so I’m hoping it’s crossbuy. If not I’m sorry but wont pay twice for a game I already own. This is definitely a game I will get for my Vita, PS3 not so much. I hope Sony realizes that most PSN titles “NEED” to come to Vita, I think a lot of us would really like PSN games on the go vs. on PS3. Heck Yeah. Games like Machinarium are perfect for PS Vita. If only Telltale would come on board and release Walking Dead, Sam and Max and other games on the Vita, it would be perfect to play on the Vita for the commute to/from work. Awesome, day one purchase. I’ve been holding off on playing the PC version and getting the PS3 version waiting for this. @ #16: we had the same exact problem bro. Bought this over the 13 for 13 sale for 2.75$.. only tried the first level but it was fun and seems worth the money i spent. I loved this game bought it for the ps3, glad to see it on vita! Amanita are you guys gonna bring your other great games over to the playstation brand? Please do! Very cool. Happy to see ios games come to the Vita that takes full advantage of the Vita hardware. I stopped buying games like this for my ipad because I loath touch only controls for this genre. I also think the price is fair compared to the ios version and will be picking it up. Sounds like you all put a lot of time and attention into this version. Okay, I will buy it. Just please don’t tell me to plug in headphones. It’s a really pretentious statement that nearly every handheld/mobile dev says to their audience. It’s just not always ideal. The worst is seeing a “this game works better with headphones” sign in the actual game because it creates an outright bad reflex from me from the get go. Look forward to playing your very strange game! Keep these great games coming! I can’t wait to get my hands on this little beauty. Woohoo! More games for the Vita. Keep them coming! Please, and thank-you. Glad to see another title for the psvita. Hope this game beats my expectations. Awesome news. Already bought this game at least twice. Thumbs up! 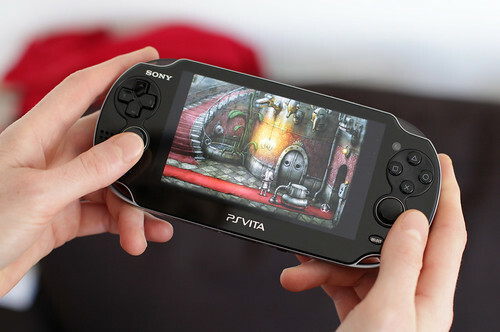 Indie games like Machinarium are perfect for/on the Vita, but they need to come sooner. Machinarium doesn’t exactly have much replayability, so if you’ve played it on the PS3 or PC, there’s not much point on getting it for the Vita. Now for those that haven’t played it, however, it’s definitely worth picking up. Will there be a demo? I’m not a big fan of point and click games but this seems interesting. Loved it on the PC, I may have to pick it up again to support. To you and everyone at Amanita Design, thank you for such a wonderful game! Bought the PC and PS3 versions, will be buying this version too. Having a discount wasn’t even a question when I read the subject line. I played your game for the first time when it was released on PS3, fell in love, and will gladly support you guys at any reasonable price point for any game you put out. I really appreciate you all putting Machinarium out on Vita; the hardware fits it like a glove. Also, I still need to get around to playing Amanita’s other titles on PC. Fun game, but why not offer a discount to those who already bought this for the PS3? This is one thing the PS4 is going to do away with. PS: PSN Network is down… What’s up? In the screenshot the image ratio doesnt fill the screen. Is there a fullscreen option for full 5″ OLED glory? yes, the game on the screenshot is in the zoom mode, you can easily switch to full-screen mode. WOWSER!!!!! I’m so happy to see the many months of rumours finally come to fruition! Indeed Machinarium was one of the primary factors in deciding to trade in my old Nintendo 3DS XL and make the jump to Vita last October – and I’m so glad I did. 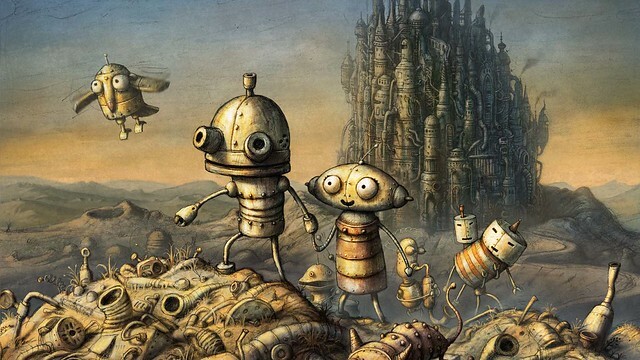 If I had to list my top ten games (across all platforms) of all time, Machinarium would be in that list. Infact it’d feature pretty high on that list too! Maybe even top five. While it can be said that it perhaps lacks a little replayability, I’ve still grabbed Machinarium for Mac and iPad, and provided we get an EU release – fingers and toes crossed – I’ll soon have it on my Vita too! Man, I’m really looking forward to playing through Josef’s wonderfully charming adventure once again. Jakub, if you’re still around my friend, can you please confirm a release for European Vita owners too? Also, do you guys at Amanita plan to bring Botanicula to Vita at some point in the future? Love your work! Big fan. hi Simon, happy you like it so much. the game will be available in Europe as well, we hope for the same release date but it’s not confirmed yet. if it’s not the same day, then in the near future. As a gamer who loves to support talented independent studios like Amanita, the fact that we can now add Machinarium to a growing list of excellent upcoming Vita titles that includes the likes of Lone Survivor, Thomas Was Alone, Hotline Miami, and The Binding of Isaac, is absolutely terrific news for those interested in the indie gaming scene! Now all we need is for Capybara to bring their utterly sumptuous point-and-click adventure, Superbrothers: Sword & Sworcery EP to Vita, and I’ll be the happiest gamer this side of a PS4 owner. @10 Mojang said they might bring Minecraft to PSN in the future once their exclusivity with Microsoft expires. This is madness. I was literally looking for new information on the Vita version of this late last night/early this morning. Glad to see this coming so soon. Definitely picking it up on Vita. I could have bought this when it was on sale, but I’m glad that I didn’t this makes a cool PS Vita game!!!!!!!! It’s kind of ironical that most of all interesting games on Vita were created by indie developers who were not known to anybody when Vita was announced, while most of highly popular franchise ports for Vita were ended up with less than uninspiring results. I didn’t see this was coming to Vita, however. I was always hoping this type of revolution would come to major console and lower the barrier for new challenges. I am very happy with the recent Vita situation. I respect you guys.